I’m actually pretty happy with the fit of the bodice. Straightening out the wavy “M” in the yoke seam was successful, and also seems to have cleared up the gaposis in the neckline. There’s still a small amount of fabric bunching at the armscye in back, but I’m going to leave it – I’ve been warned about the dangers of overfitting, and I’m concerned if I try to take out every last wrinkle I’ll also remove mobility from the arms. There are some diagonal strain lines coming off my left shoulder (to the right in the photo). I saw this in the original shirt as well, so I might try to address it. I managed to properly establish the neckline on this muslin. The Muslin F neckline was initially too tight in front. Using a Sharpie, I drew in a neckline with the muslin still on me. Then I clipped the curve in front down to the new neckline until it felt comfortable. 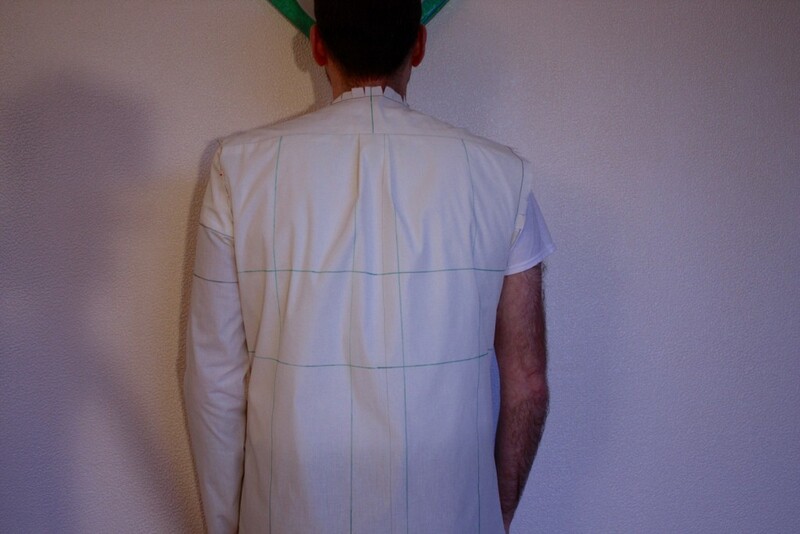 In back, the neckline looks more or less OK.
With the bodice looking reasonable, and the neckline sorted out as well as it can be without attaching a stand and collar, my thoughts started turning towards the sleeve. 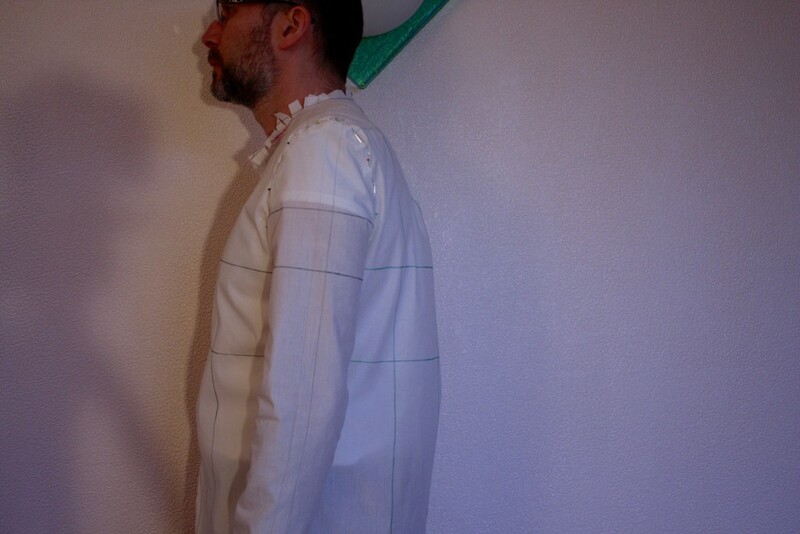 When I took the tuck in back to even out the shirt balance, I also removed an inch from the armscye circumfernece. 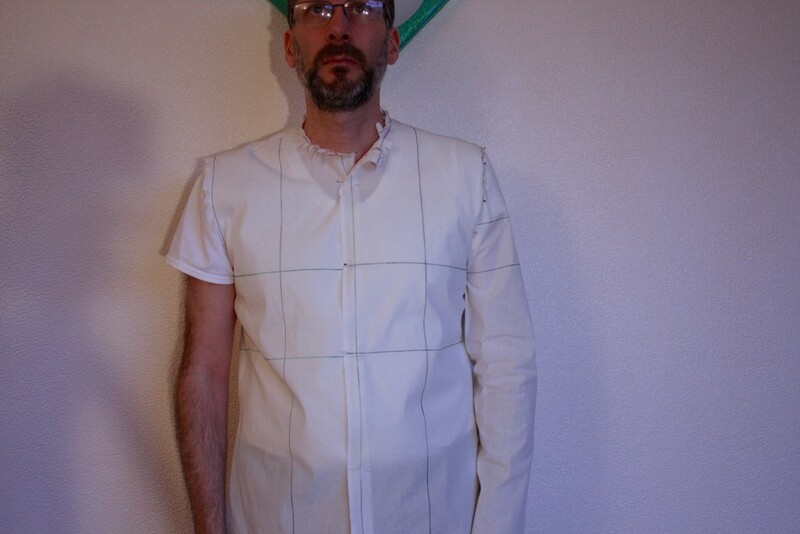 Plus, I had done some sleeve fitting way back around Muslin A, and I knew that the sleeve cap height needed to increase, in order to address the drag lines on the sleeve. The sleeve I traced from the original shirt no longer fits the pattern. On a lark, I decided to draft a new sleeve following the instructions in Don McCunn’s book, How to Make Sewing Patterns. I measured my sleeve cap height (from shoulder tip to underarm), as well as my bicep circumference and palm circumference. Ignoring my computer, I followed the instructions in the book and drew on top of the original sleeve pattern from Muslin A. It was surprisingly easy to do. The updated pattern piece has a much taller sleeve cap and is narrower than the original shirt, so much of the fullness in the sleeve is gone. The sleeve cap has no ease with respect to the armscye. The sleeve turned out way better than I expected for a first effort. It feels a little bunchy because it has a lot less ease, but in a drapey shirting fabric I think it could be just fine. I might have some mobility issues – it pulls somewhat when I reach forward, but it’s hard to tell because the sleeve is pin-basted in place. And the whole shirt pulls upwards if I reach overhead. According to Paul Gallo, raising the underarm point can solve the upward pull issue. But it would likely change the armscye circumference and require an updated sleeve. I hope to discuss it with him in class this week, perhaps when he covers sleeves in detail. I said I was coming out of the closet, and I mean to do that. 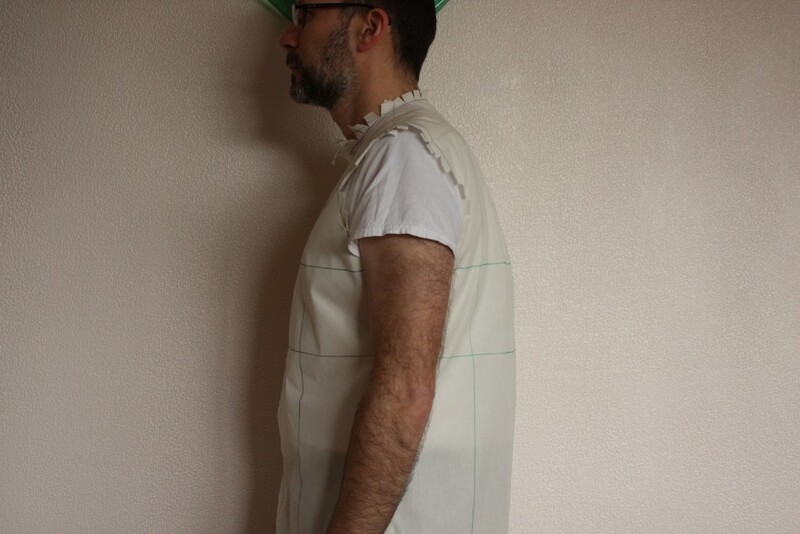 But I will probably talk about my course in Draping and Patternmaking with Paul Gallo. Congratulations! Muslin F is looking great! You nailed the neck gaposis and the HBLs are sweet! My feeling is that the pull lines in the left back will go away if you clip into the seam (just a little at a time!) in the bottom rear quadrant of the left armscye. 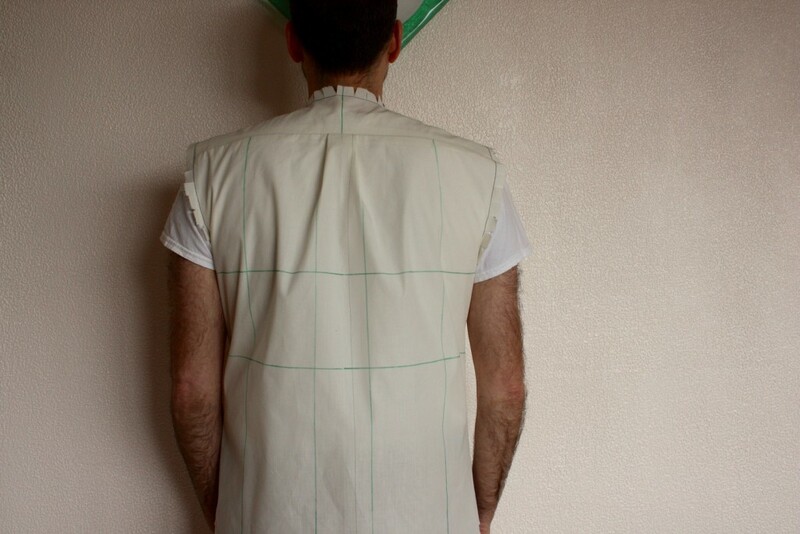 If this works, and you have to redraw the stitching line, you will have created an asymetrical back which you won’t be able to cut on the fold. It’s really not that big of a hardship to cut it flat…I know because DH (all those years of working as a shipwright, you know) is much more muscular on his right and EVERY right/left pattern piece is different. As for your sleeve, I salute you for adding to the sleeve head. I know men’s sleeves are classically cut with a flatter sleeve head, but like you, I dislike the pull lines that result. Having said that, from looking at your sleeve and reading what you say about it feeling a bit tight, it is possible you are a skosh short of ease in the bicep. My DS likes his shirts FITTED, but even he has accepted some ease in the bicep. If you decide to give this a try, I think the solution will be easy, i.e., a vertical half inch opened at the front and back armscye notches (tapering to nothing at the wrist) which will give you a bit of added ease and only an inch to ease into the armscye (from experience, I can tell you that will be no problem, even with a firm cotton shirting fabric). Lastly, it looks like the vertical grainline in the sleeve is canted ever so slightly towards the front…this could be posture, but if not, the sleeve shoulder point might be asking to rotate forward, probably just 1/4 inch. (My new favorite way of doing this can be found at http://handmadebyheatherb.blogspot.com/2013/10/forward-shoulder-adjustments-for-sleeves.html). Thanks for the advice, it’s appreciated – even though the blog is written from a “documentary” point of view, rather than a solicitation for suggestions. As it turns out, my class instructor tells me he never cuts out patterns on the fold; it’s something that home sewers do. Cutting flat always gives you more control to ensure the fabric is on grain, and also works better for aligning stripes and plaids. 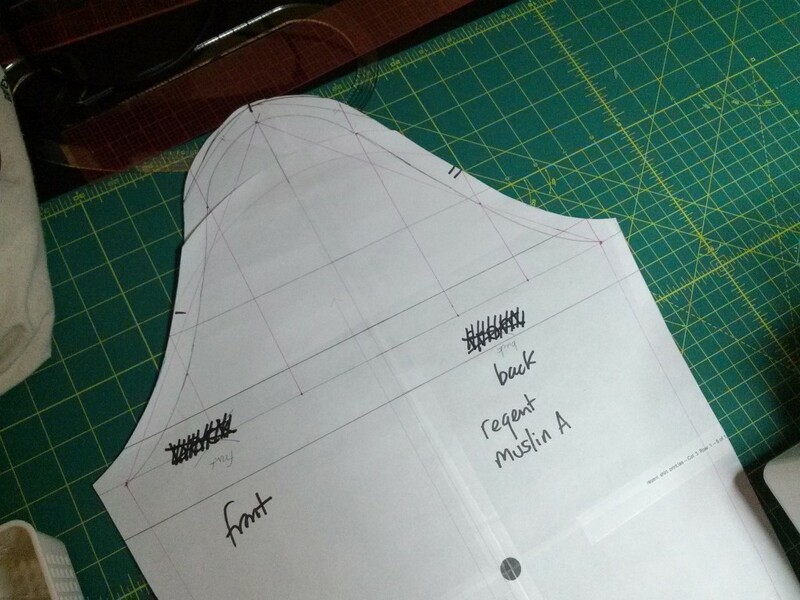 For pattern pieces that are normally cut on fold, he folds the pattern paper and traces out the other side, then cuts out a full pattern piece. All by way of saying that it probably wouldn’t be too big of a deal to make an asymmetrical back piece. But that could lead me down the path of making two individual sleeve pieces to match up with the asymmetrical armscyes. I’ve been trying to avoid making an asymmetrical pattern up until this point, aiming to see if I could get a “happy medium” that works okay with both sides of my figure. I agree with you and the other commenters that the sleeve is perhaps too narrow and needs more ease around the bicep. I was just happy that my initial attempt to make a sleeve wasn’t a disaster! I agree that an inch of sleeve cap ease would not be too difficult to work into a sleeve cap – I’ve done it before in previous projects – but I’ll be looking at all the alternatives for adding ease in this area. You’re not the only reader who noticed the vertical grainline in the sleeve is off-kilter. The alteration you posted looks interesting since it looks as if it rotates the shoulder point forward, WITHOUT altering the side seams or placement of the underarm point. That’s interesting – thanks for the link. Thank you. I do agree that more ease/larger sleeve would be better; right now the sleeve does look tiny in proportion to the bodice and I think the visual proportions should be better balanced. I’m taking the muslin to my class tonight and hopefully I can get some advice. Hmmm. I’m thinking ahead about the eventual construction. This sleeve looks like it will have to be set in. Is that the route you want to go? I’m used to sewing the sleeve on with the garment flat (before the sleeve and body seams are sewn). This tall sleeve cap would be damn near impossible. Still, it’s your shirt and should look and fit the way that YOU want it. Onward ho! I hadn’t really thought about construction. 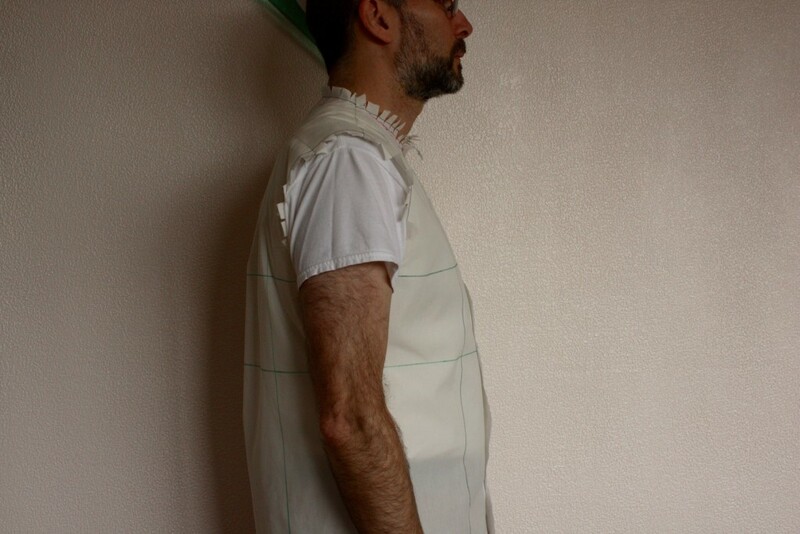 There is no sleeve cap ease, so it’s just steep curves to negotiate in the sewing machine. I do prefer the look of the tall sleeve cap because like my other commenter Jude said, It eliminates a lot of the drag lines in the shoulder by getting the fabric on grain. The sleeve was really just a “what the heck” sort of thing that turned out better than I expected. I am taking the muslin to my class tonight and hopefully I can get a consult from my instructor. Side view shows you need to rotate the sleeve forward. That will put the sleeve center at true vertical and the horizontal sleeve grain lines will be parallel to floor. Thanks for the feedback on the sleeve. While viewing the photos, I noticed the grain line was off vertical, and I suspected that I needed to rotate the sleeve to make it hang properly. So thank you for confirming my thoughts. A comment on shirt sleeve cap ease. 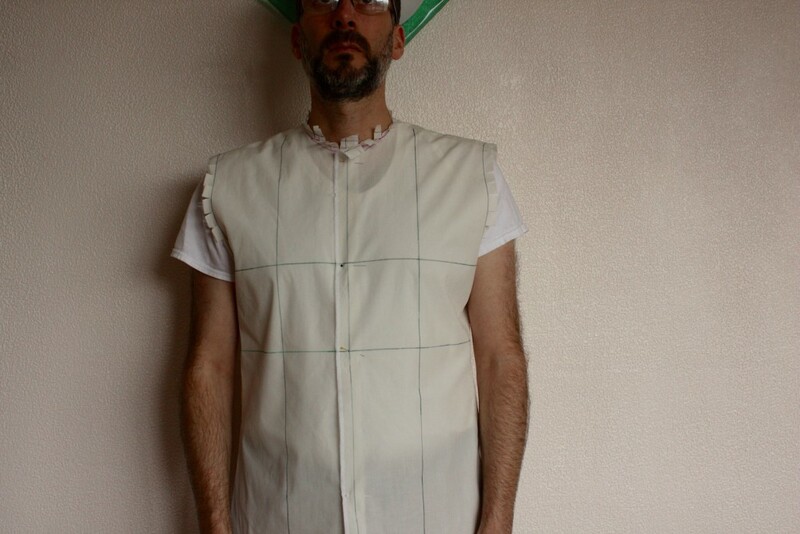 As a patternmaker I never add ease to a man’s sleeve cap. Have you tried to flat fell a seam that needs one side to ease into the other? Not practical! Frankly, no ease is necessary. Ease produces a roundness and slight puffiness at the cap; a fine look for a ladies blouse, not so hot for a mans shirt. In your case, I think your cap height is a bit high. You might reduce the height and increase the biceps width, matching the cap to the armscye without ease.